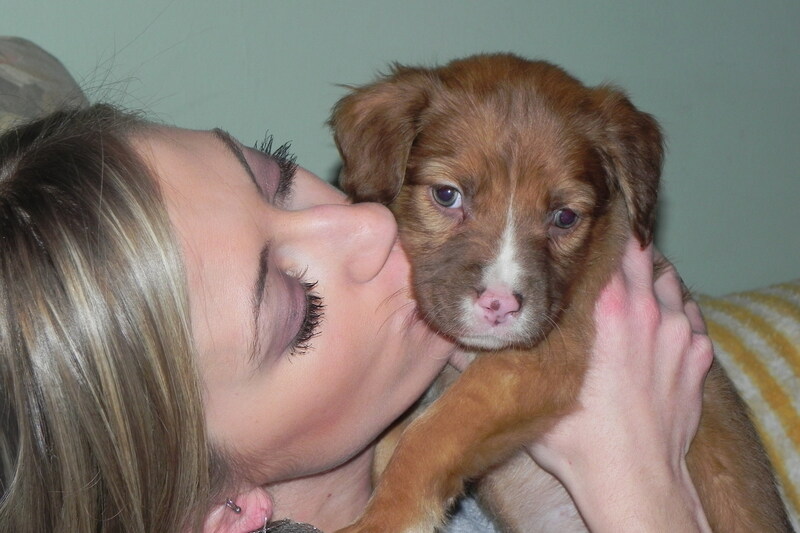 This weekend, we took in a foster puppy. You can read the whole story on the Bark Around Town blog, but trust me. It’s one snuggly, barking, peeing bundle of fun. 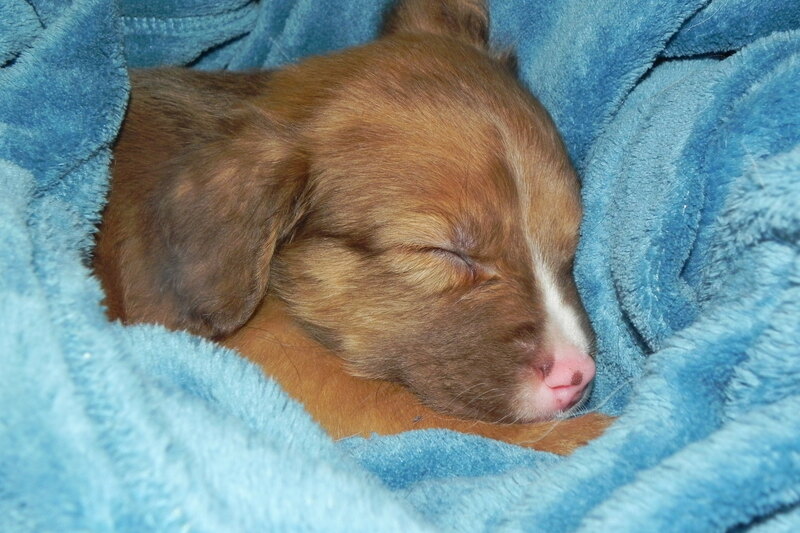 Bailey is a 6 wk. old Pit Bull/German Shepherd mix who was brought to the shelter because her owner was trying to dump … er, find homes … for two pups left from a litter. 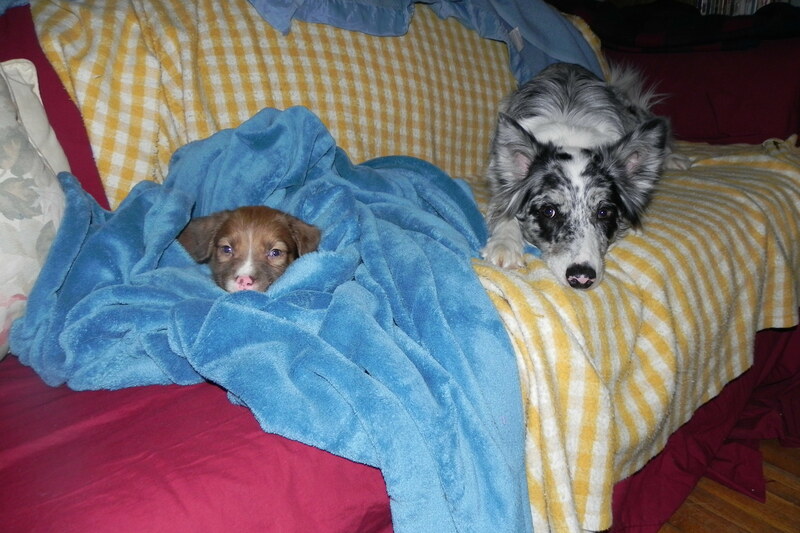 That the pups shouldn’t have been leaving their mother at 6 wks. goes without saying. For responsible dog owners. One volunteer took a pup for her brother, who wanted a Pit Bull pup. I took the other to foster while Pitty Love looks for a home. She’s a beautiful dog, and my hope is that Scout and Bandit can help her learn how to be a good dog. Well, Scout can anyway. Hopefully Bandit doesn’t teach her how to eat from the fridge or lick dishes from the kitchen sink. 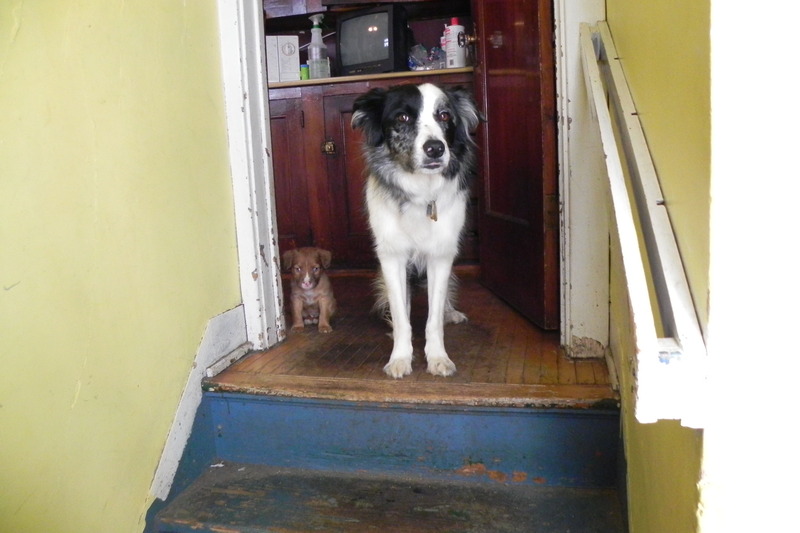 Look how little Bailey is next to Scout! It’s 1 AM and I can’t sleep because every time I close my eyes I keep thinking about a dog. It’s a story I heard earlier this week, a story about a dog that died while in care at an animal shelter somewhere in the U.S. It’s a horrible story about a dog that died a horrible death, because someone somewhere along the line made a mistake. 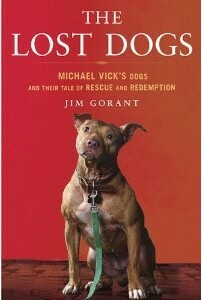 The Lost Dogs, by Jim Gorant, chronicles what happened to Michael Vick's dogs after the trial. I posted my review of Jim Gorant’s upcoming book, “The Lost Dogs: Michael Vick’s Dogs and Their Tale of Rescue and Redemption,” over on my Bark Around Town blog. You don’t have to be a lover of pit bulls to find the book inspiring and heartwarming. It’s a must-read for any dog lover. Picking up on the YouTube phenomenon “JK Wedding Dance” video, the folks at the Nevada Humane Society have created their own dance – celebrating dog adoption! You can learn more on the website for the Nevada Humane Society. And if you’re looking for a pet in Rochester, why not visit Rochester Animal Services, the shelter for the City of Rochester? There are lots of cats and dogs available for adoption. Visit the shelter’s website or stop in at 184 Verona Street, at the corner of Brown St, near Frontier Field. 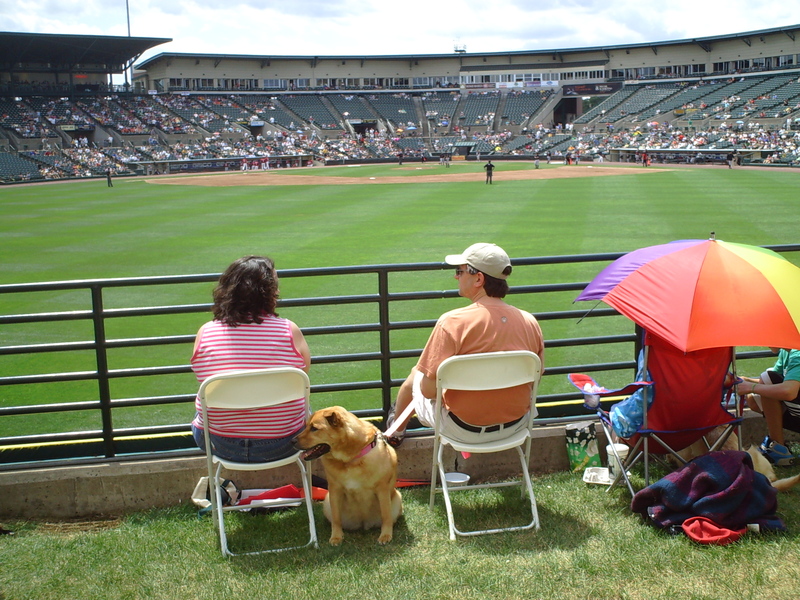 Today was the annual Bark at the Park at Frontier Field, the day dog lovers get to take their pups to the ball game. Rochester Animal Services had a table at the event, and volunteers with buckets and sponges cooled off the hot pups. 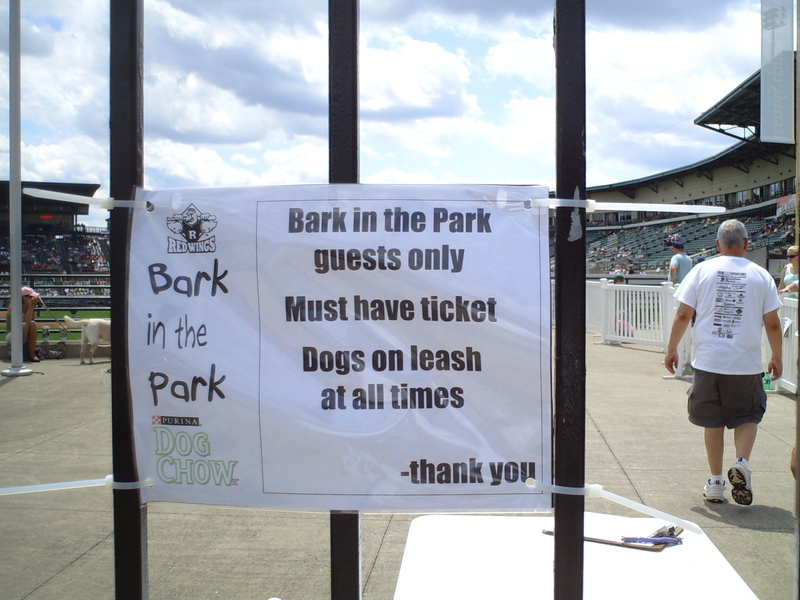 Baseball fans with dogs are restricted to the grassy area just past the outfield, and you might expect some excitement when you get almost 100 dogs in one space. But it was all quiet – in fact, very little barking at the park! We got a call at the shelter this week from a woman who wanted to know if we had a list of apartment complexes in the city that allowed cats. She left a message on the voice mail explaining that she had a bunch of cats, that her landlord found out, and now she has to move ASAP. She didn’t want anything to happen to her cats. This, my friends, is part of the reason why shelters get overrun with cats. People do a wonderful thing when they adopt a cat or take in a stray. It’s one less cat in the shelter, and a cat can be a great pet for apartment-dwellers. But if they don’t have permission to have the pets, there’s always the chance they’ll have to surrender the animals when their landlord finds out and they have to move before they find another, pet-friendly, apartment. That kind of disruption isn’t great for the cats or the shelters that are already bursting at the seams with cats that need homes. So it’s important to balance our good intentions with a realistic approach to animal rescue. Not every animal will be rescued; that’s just a fact of life. So if you live in an apartment and have permission to have a pet, fantastic. If not, consider volunteering at the shelter rather than keeping cats on the sly. It’ll be better for you and the animals.